Menu and prices for Aramark's World Meeting of Families vendors. 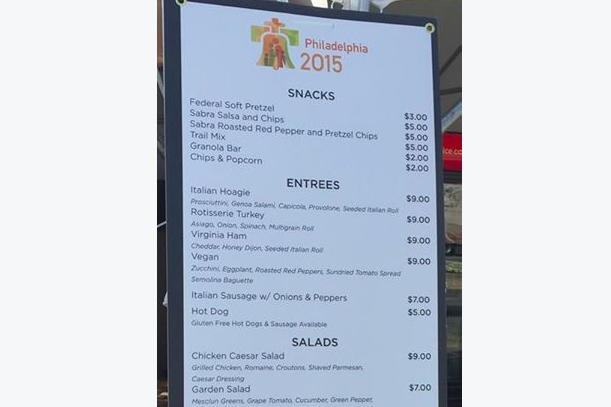 Spending lunch on the Ben Franklin Parkway for the Pope's visit to Philadelphia: Priceless? On a normal day, it's safe to say no one would want to fork up $70 for a lunchtime meal. But when World Meeting of Families retailer Aramark's concession stands are the main option for hungry pilgrims, sticker shock is expected. BillyPenn obtained a copy of Aramark's "Family Pack" offerings. Included in the lunch for two are sandwiches, chips, pretzels, Tastycakes and drinks, along with "Commemorative Pope Cards w/ Medal." The Tastycakes come in a special WMOF collectible tin. According to BillyPenn, the same food items would cost approximately $28 for two people at an average corner convenience store. Here's the full menu and price list, thanks to one Facebook user. Philadelphia Magazine is also reporting steep price increases at various franchises in Center City. One Dunkin' Donuts, for instance, hiked the cost for a medium coffee from $2.04 to $3.23. With an event as historic as this one, you're bound to pay more for convenience. But how much is too much?